may temporarily speed it up. The diagram above shows the amount by which the average length of a day was longer than 24 hours, measured in milliseconds, for the years 2000 to 2014. 1 millisecond equals one thousandth of a second. This announcement can only be made around six months in advance. 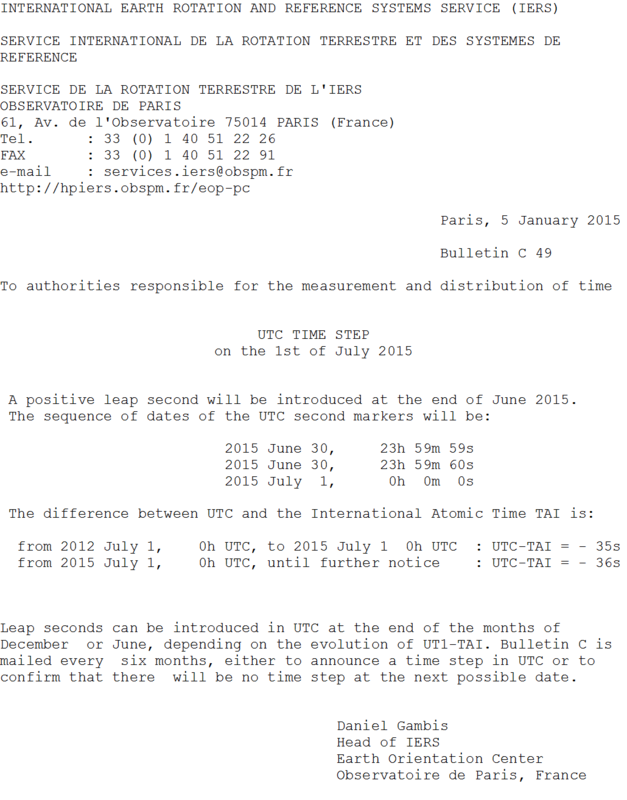 For example, the official announcement of the June 30 leap second was made on January 5 2015 by the following bulletin. When the last leap second was added back in 2012, a number of data centres and websites around the world experienced system problems and crashed. This was because they did not allow for 61 second minutes and interpreted this unforeseen event as a system failure. It is likely that many other sites will experience similar problems this time round. To minimise the risk many U.S. stock exchanges including the New York Stock Exchange will close early to reduce the impact of any potential problem (Ref 1). There are normally 86,400 seconds in day, but in the 24 hour period which has a leap second there will be 86,401. 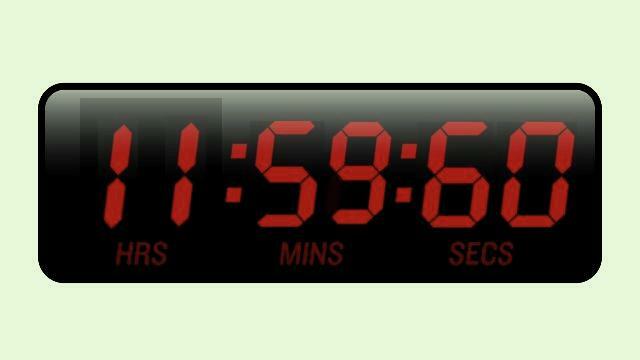 By using slightly longer seconds Amazon avoids having to add a leap second, but this means that its computers will be up to half a second out from GMT between 12:00 on June 30(A) and 12:00 July 1(B). For more details see ref 2. What will happen in the longer term ? As the length of the day gradually increases time, the frequency of leap seconds will need to increase. In 100 years time we will have, on average, a leap second once a year and in 1,000 years time we will have 7 leap seconds per year. The extra second is inserted at 23:59:60 at 30 June 2015, Greenwich Mean Time (GMT). 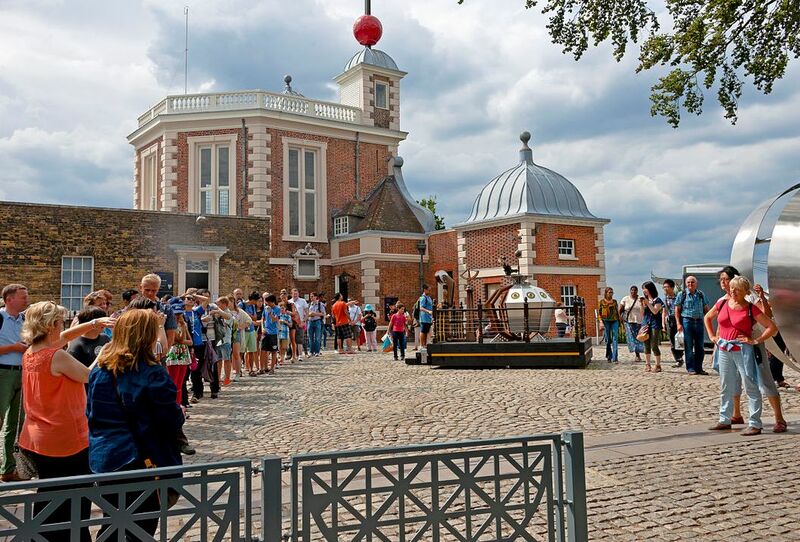 As Greenwich – and everywhere else in the UK – will be operating on British Summer Time (BST), the extra second will actually be inserted just before 1am on the morning of 1 July. New York is 4 hours behind GMT, so the extra second will be added at 19:59:60 on 30 June, and in Beijing, 8 hours ahead of GMT, the extra second will be added at 07:59:60 on 1 July. 1)The average length of day when calculated over a entire year is just over 24 hours. However, over the course of a year the the actual length of a solar day varies. This variation throughout the year is due to entirely different effects than the slowing of the Earth’s rotation. It is at its longest – 24 hours and 30 seconds – around Christmas day and it is shortest at around 23 hours 59 minutes and 38 seconds in mid September. This is variation is described in more detail in my post 12 Feb 2015: A special day. 2) The term Greenwich Mean Time is no longer used by astronomers. It is ambiguous, as you will see below. Instead, astronomers use two different times which agree with each other to within 1 second. In common use, Greenwich Mean Time (GMT) is often taken to be the same as UTC , which is the approach I have taken for this post. However, it can also be taken to mean UT1. Owing to the ambiguity of whether UTC or UT1 is meant, and because timekeeping laws usually refer to UTC, GMT is normally avoided in precise writing. If I may say, I thought this was an excellent accesible account of how leap seconds work. It’s not easy to blend solid science and readability! I will attempt to post a link on my FB page. Do let me know if you ever write anything about telomeres and ageing as this is a key theme of my sci-fi novel Biotime. Google Dr. Al Sears. He has the latest on telomeres and is probably one of the best sources for understanding human aging. Fascinating. But, let me ask, is your subjective experience of the passage of time in the opposite direction? I mean does there now seem to be less time in a day than there was when one was a child? If so, is that because as each year passes, a year is a smaller fraction of life so far, or is there some other explanation, such as the pace of life with instant communication and the digital world stimulates certain frequencies in brainwave. Do you have a view on this? Wow, this was a fascinating post. Upon reflection, it makes sense that there would be some variability in the time the earth takes to rotate, but I’d never thought about it before. To be completely clear, GMT does not have leap seconds, and it never did, but then again, there is no authority who defines the meaning and implementation of GMT. UTC has had leap seconds since 1972 according to the authority of the ITU-R (originally CCIR) and the implementation is handled by IERS (originally BIH). Except that UTC does not have leap seconds if it is being handled according to POSIX rules. Therein we have two international standards in disagreement with each other , which is what evokes problems. http://www.ucolick.org/~sla/leapsecs/ and there is some interesting content there. Of course, you are correct in the sense that, strictly speaking, I should have used the term Co-ordinated Universal (UTC) time in this post rather than GMT, but I decided to use GMT rather than UTC as this is the term more widely used by non astronomers. I have amended the post to put a short note at the end to explain this. I didn’t know anything about leap seconds until I read this, and it was easy to understand. Thanks for writing it! I had read about leap seconds somewhere long ago. I will think of this post on June 30! Thanks for stopping by my humble blog! Reblogging. Hope you won’t mind. What a comprehensive and interesting writeup! 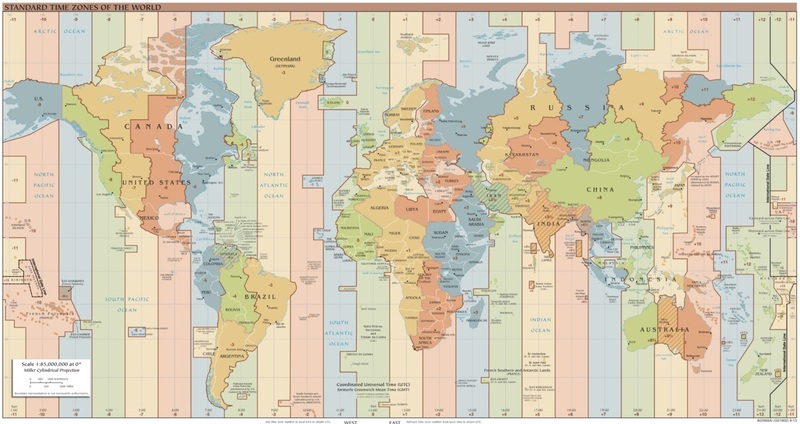 Wow..Something new to learn…leap second! Thank you for this. As a homeschooling father, this filled an important need and I’ll definitely be making use of your excellent blog in the future. Any extra time will be added to the kids’ schoolday!